Space Shuttle Discovery launched on its STS-131 mission from Kennedy Space Center in Florida shortly before dawn on April 5, 2010. 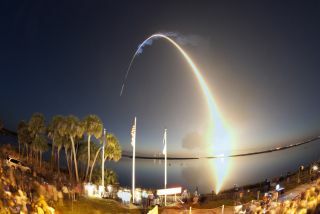 Time-elapsed photography captures Discovery's path to orbit. Liftoff from Launch Pad 39A at NASA’s Kennedy Space Center in Florida was at 6:21 a.m. EDT April 5 on the STS-131 mission. The13 astronauts aboard the linked shuttle Discovery and space station marked the twin anniversaries of the birth of human spaceflight and NASA?s space shuttle fleetMonday, even as the U.S. space agency is winding down its reusable space planeprogram. Discoveryhas been docked at the space station since last week as its crew hauls tons ofcargo into the station. The first-evershuttle mission, STS-1 aboard Columbia, launched 29 years ago today, exactly two decadesafter the former Soviet Union inaugurated the era of human spaceflight with thelaunch of cosmonautYuri Gagarin into orbit in 1961. Now,NASA plans to launch just three more shuttle flights after this one beforeretiring the three-orbiter fleet in September. To date, 131 shuttle missions ?including Discovery's ? have launched into space. "Ithink everyone feels a little bittersweet about seeing the space shuttle cometo an end," Discovery's pilot Jim Dutton told reporters today in a seriesof televised interviews. "We really have a lot of people who love theshuttle, but we have to continue to press into the future." NASA'sfuture, currently, calls for the cancellationof the Constellation program that was building the new rockets andspaceships to replace the retiring shuttle fleet. Instead, the space agencyplans to rely on Russian Soyuz spacecraft to send astronauts to theInternational Space Station until U.S. commercial spacecraft are available toferry crews to and from low-Earth orbit. U.S.President Barack Obamaannounced the new direction for NASA in February. He is expected to announcenew details on Thursday during a presidential visit to the Florida home ofNASA's space shuttle fleet. "I'mhopeful for the future, and I think the leadership and the folks who makepolicy decisions will do the right thing and we'll be able to get the jobdone," said Discovery commander Alan Poindexter. Therehave been two shuttle accidents in NASA history. TheJanuary 1986 Challenger shuttle disaster occurred just after liftoff, when thespacecraft exploded and broke apart. The shuttle Columbia broke apart duringre-entry on Feb. 1, 2003 due to heat shield damage. In all, 14 astronauts werekilled. After each accident, NASA stood down from shuttle flight for two yearsto make safety changes. Nearly30 years after the first shuttle flight, there is still room for space firsts. Thismission joined fourwomen in space (three on Discovery and one on the space station) for thefirst time. One of those female spaceflyers ?Japanese astronaut Naoko Yamazaki ? also joined fellow astronaut Soichi Noguchi of Japan at the station when the shuttlearrived ? the most Japanese astronauts ever in space at one time. Yamazakiand Noguchi spoke with Japanese space officials and schoolchildren earlyMonday. They even paused to recite haiku, Japanese poems, and play atraditional Japanese folk song on a wooden flute and stringed instrument. ForDiscovery astronaut Dorothy ?Dottie? Metcalf-Lindenburger,34, the mission is especially poignant. As a young girl, Metcalf-Lindenburger attended Space Camp in Hunstville,Ala. She remembers when her mother bought her a model space shuttle. The nameon that toy shuttle: Discovery. "Ithink it's pretty special that I got to come up on Discovery," Metcalf-Lindenburger said. Discoveryis the oldest of NASA's three-orbiter fleet, but wasn't the first shuttle tofly. NASA launched STS-1 with a skeleton crew of two test pilots aboard ?veteran Apollo and Gemini program astronaut John Young and then-rookie Robert Crippen. The two men were in space for about two days afterlaunch on April 12, 1981. Withjust three more planned shuttle missions after this one, Discovery's flight isalso marked by some lasts. Metcalf-Lindenburger isthe last of NASA's teacher-astronauts expected to fly on a U.S. space shuttle. Themission is also the last shuttle flight expected to carry a Japanese crewmemberand the final mission to include a full seven-person crew ? making the 13astronauts aboard the station the last big crowd in orbit. Each of theremaining three shuttle missions will have six-person crews, NASA officialshave said. Discoverylaunched toward the space station on April 5 and is due to land on April 19.The seven astronauts took a half-day off today, moved some of the 17,000 pounds(7,711 kg) of cargo they are delivering into the space station and alsoprepared for their mission's third and final spacewalk. Thatfinal spacewalk is set to begin early Tuesday morning. Duttonsaid that while NASA's space shuttles are old, they are nonetheless marvels ofhuman engineering. Withoutthe shuttle fleet, iconic spacecraft like the HubbleSpace Telescope wouldn't have experienced the success that they have. Theshuttle's ability to carry astronauts to Hubble and fix it over time has been ahuge factor in the space observatory's success. Theshuttle also has a huge, 60-foot (18-meter) payload bay, making it theonly spacecraft in service today capable of hauling large pieces and spareparts to the space station. The$100 billion space station has been under construction since 1998. NASA's lastfew shuttle flights have been dedicated to stocking up the space station withthe parts it will need to keep flying through at least 2020. "It'sbeen a tremendous vehicle," Dutton said, with the space station serving asthe "crown jewel" of the space shuttle era. "We're going to missit. There's no question about it."